Photographer Ryan Christopher, featured in 'The Winter Issue', discusses his passion for creating significance and meaningfulness in his images. One of my most prominent memories was my first trip to Europe; the vivid moments of travelling through the highlands of Scotland and the Jungfrau region of the Swiss Mountains. I was so inspired by the landscapes I would stare and admire the views for hours. I couldn’t take my eyes off the natural landscape. The simplicity and wonder around me stirred me to start capturing the moments I was inspired by. I quickly realised that this beauty wasn’t just for me to notice, but for everyone. I caught a vision to capture landscapes that would hopefully compel others to notice and be awakened by the beauty that’s all around us. How does it feel to have one of your Unsplash images featured in the first volume of Rucksack Magazine? I’m super honoured and thrilled to have my image in Rucksack Magazine. I love the passion and work that has been fleshed out into the Winter Issue. There are so many brilliant photographers around the world and I felt incredibly overjoyed to see my image in the magazine. 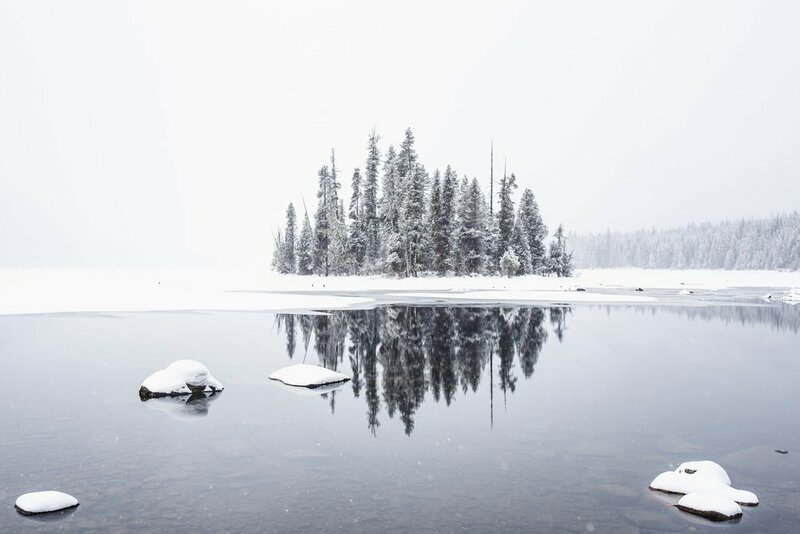 The photo was taken in Lake Wenatchee, Washington. It was a complete surprise for everyone out there. I was expecting to see mountains all around the lake and the weather ended up being a complete whiteout. You could barely see anything in the distance except the Island of Trees which is the focal point in the photograph. Where has been your favourite location to shoot? British Columbia. Some of my favourite places I’ve encountered have been in Canada. More specifically: Garibaldi Provincial Park, Vancouver Island, and the surrounding areas of Squamish. Which images have been your most significant so far? The most significant images have been the ones I captured on my honeymoon in Italy. My wife and I hiked the Path of the Gods along the Amalfi Coast and I’ve never seen texture of a coast like that before, with tons of homes on the cliff side along the Tyrrhenian sea. It was truly brilliant. The significant part was who I was with and the shared experience of seeing the dream-like beauty around us. These types of photography moments are the most valuable to me. What camera equipment and gear do you use? Currently, I use my Nikon D750 for all of my photography work. My go to lens is the Sigma 35mm 1.4 for my travel photography. WANDRD PRVKE is the travel bag I use to carry all my gear and equipment, and has been a fantastic addition to my travel experience as a photographer. Where are you excited to photograph in the future? Chris Burkard. His work has influenced tons of people for a reason. He’s exceptional in his photography and his passion exudes in the way he speaks and lives by it. He was one of the first landscape photographers I followed on Instagram and I was immediately hooked. My favourite photos of his are of the surf adventures in the most remote places on earth. There’s a deeper purpose and meaning to his work, and I would love my photography to reflect such purpose and meaning. A visual image can speak more to the soul of a human being when phrases and words can’t. I hope my work encourages others to feel a sense a freedom to pursue life with a sensitivity to listen and notice the beauty that surrounds them every day. View more of Ryan Christopher's work by visiting his website.